Trella is "fifteen point one four centiweeks" old or, in "old-time measurements," she is "seventeen point three years old." She lives in a huge structure which has four levels with nine quadrants on each level. The privileged members of her society are called Uppers because they live on Level Four. The enslaved workers of the society live and work on Levels One and Two and are called scrubs because they spend their lives doing menial labor. The brutal Population Control Police, or Pop Cops, rigidly control every aspect of the scrubs' lives, including the most personal one of all--they don't allow the scrubs to form family groups. All children are taken away at birth and raised by Care Givers in small foster-care groups until they are around age fifteen. At that time they are assigned to their lifetime job, which is based on the aptitude they show from childhood. They either work in the food-production area, the kitchen, the laundry, the recycling plant, the waste-management plant, or some form of maintenance or cleaning--the accumulation of dust and rust are absolutely forbidden. From her earliest years, Trella displayed a strong interest in and talent for climbing. Due to that and her relatively small size, she was a natural to be assigned to the pipes, the network of ventilation and plumbing pipes throughout the four levels. Scrubs never have vacations or days off. They spend their lives working ten hours on and ten hours off, day after day. They are not provided any form of recreation, including anything to read--they know the basic Three R's (reading, writing and `rithmetic), but only so they can learn the Pop Cop propaganda version of their people's history and obey written instructions. Trella is an intense loner who trusts no one but Cog, a slightly older member of her care group from childhood. She sleeps in the pipes as much as possible because the thousands of scrubs are crammed together in huge barracks with zero privacy. They even have to share the bed they use, with one scrub having the bed for one ten-hour shift, and the other one getting it for the alternating shift. Trella hates her life, but she's found a certain level of grudging acceptance, until Broken Man, the latest in a line of prophets slumming among the scrubs from the upper levels, shows up preaching the religion of the Gateway. Trella hates the myth of an imaginary doorway that leads from "Inside," this structure they are all trapped in, to "Outside," a world of wide-open space and glorious freedom. Life is already hard enough without false hope. Most prophets limit themselves to asserting that this world of freedom comes after death, if a scrub has lived a hard-working, obedient life. But Broken Man dares to claim that Gateway is real, something living people can access. This is truly dangerous talk, and Trella is convinced that he's a Pop Cop spy, sent to help them weed out anyone among the scrubs with rebellious tendencies. Cog fervently disagrees with her. He firmly believes in the prophet, and Trella is terrified for his safety. She is determined to turn him away from Broken Man by finding evidence that proves the prophet is a fake. But shockingly, her search through the pipes uncovers information she never could have imagined existed that indicates the Gateway might actually exist, exactly as Broken Man asserts, as a reality in this world. When word of her finding gets out, Trella learns she has inadvertently lit the fire of a scrub rebellion that puts Cog's life at far greater risk than before, as well as her own life and that of uncounted other scrubs. I found this book absolutely gripping. The action and suspense never let up. Trella is vividly drawn, believable and, in spite of her disillusionment and bleak outlook, an ultimately hopeful character, because she is resilient and a true survivor. As Queen of the Pipes, she has unique and amazing skills that make her a powerful freedom fighter who, in spite of her natural fears and misgivings, never gives up. The subcharacters in this book are also vivid and compelling. My favorites were the tech experts among the scrubs. They are Mission Impossible type nerds, and I loved their contribution to the rebellion. The book leaves a great many questions unanswered about the history of Trella's world, but this is the first book in what will, I presume, be at least a trilogy, so I assume the missing information will be revealed later. 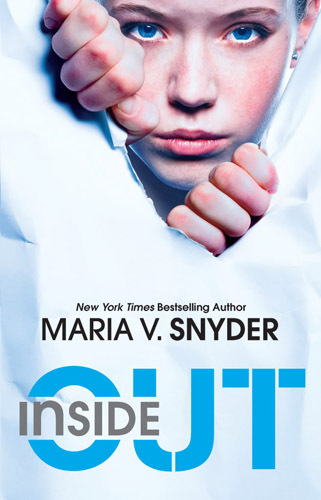 This book is followed by the sequel, Outside In. I highly recommend this book to fans of YA dystopian novels. Fans of Birthmarked and The Hunger Games, in particular, will appreciate this new series. I love this series! Thanks for the review letting people know about it.